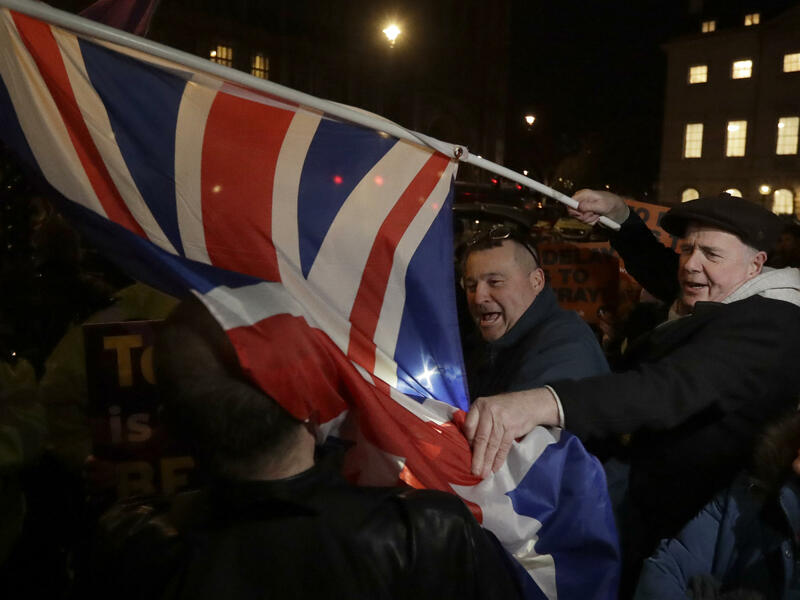 Brexit supporters and opponents shout at each other outside Parliament in London on Thursday, the day that British lawmakers voted to delay Brexit. Brexit has convulsed the United Kingdom like no other political event in decades, but it can be hard to follow the day-to-day machinations. At the end of a chaotic week, here's what to know. Likely. All 27 remaining EU countries must agree, and there are genuine divisions, but the EU is expected to say yes. That's because it's not seen in anyone's interest — except some hard-core "Brexiteers" in Britain's Parliament — for the United Kingdom to crash out of what is effectively the world's second-largest economy. That's a major EU concern. It is already exasperated with the chaos in Britain's Parliament. Officials in Brussels have made it clear they want either a short delay — or a very long one. They don't want rolling cliff-edges. The U.K. government and Parliament will have to figure out a way to break the deadlock that has paralyzed politics in this country for months. It's hard to say what a solution might look like. Jeremy Corbyn, the leader of the opposition Labour Party, is talking of a much softer Brexit in which Britain would remain in a customs union with the EU. Some in Parliament want a second referendum. She still has her job, which is remarkable: In normal times, which seemed to end in the U.K. after the 2016 Brexit referendum, a prime minister who had suffered such stunning defeats would've resigned long ago. But Brexit has turned U.K. politics upside-down and created a new normal. There is always the threat of another Parliament-wide no-confidence vote — she's already survived one — and the possibility of a general election. But May looks to stay in power for at least a while longer. Probably for years. Right now, Brussels and London are only arguing over the Brexit "divorce" arrangement, unwinding more than 40 years of economic integration. After they sort out the terms of withdrawal, they will have to negotiate a new free-trade agreement, which typically takes years — and which analysts say will be even more difficult than what we've been witnessing. It's easy to get bogged down in the details of political maneuvering and parliamentary arcana, but what are the overarching issues here? We are a country which is very secure in its island identity, on the back of the history of the world wars and the British Empire. We're at a moment where we're trying to work out who we are and our place in the world — and the tension within Brexit is that a lot of the Brexiteers talk the language of Britain reaching out beyond Europe, being a global trading nation and reaching to all parts of the earth, but on the other hand, they also talk the language of pulling up the drawbridge and wanting to . . . separate ourselves from the immigration problems of Europe. Well, both things can't be true and we've got to work out as Britain what are we about in the 21st century. Producer Samuel Alwyine-Mosely contributed to this report.